Whiteface Mountain, often called “the Winter Sports Capital of the World”, is in Wilmington, New York, outside of Lake Placid. Host to the 1980 Winter Olympics, the resort is now the perfect place to attempt your bucket list alpine activities, including the luge, skeleton, and riflery. Or, simply experience all-natural terrain and the highest vertical drop in the East in the gorgeous Adirondack Mountains. 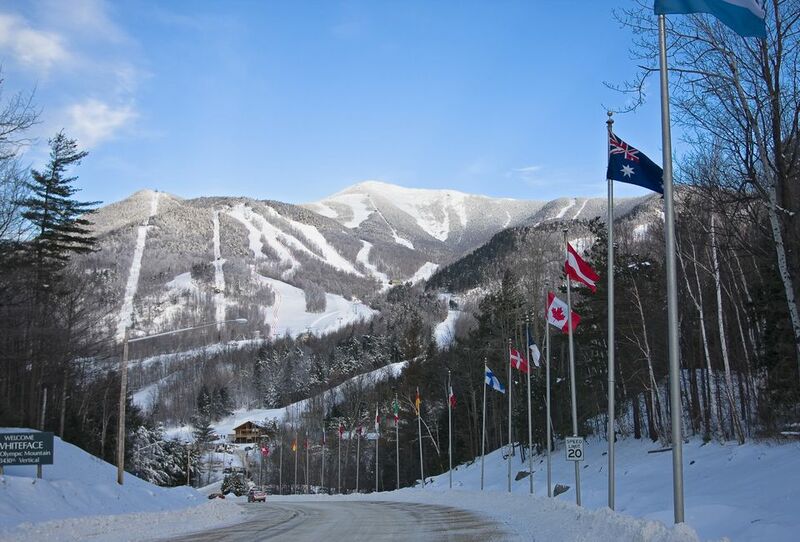 The resort is a two-hour drive from the airports of Albany, Burlington, and Montreal, and even closer to Adirondack Regional Airport and Plattsburgh International Airport (with daily service from Boston). If you’re driving, it’s just two hours from Montreal, two and a half from Albany, three from Ottawa, and five from both NYC and Boston. Whiteface is the fifth highest peak in the state. Base elevation is 1,220 feet and peak elevation is 4,867 feet. The highest elevation for skiing is 4,650 feet at The Slides (described below). The ski season at Whiteface Mountain is typically November to mid-April, but depends on spring snowfall. Eleven lifts (one eight-person gondola, one high-speed detachable quad, one fixed quad, two triples, five doubles, and one conveyor lift) provide access to 87 trails. Snowfall over the last few years was 281 inches in 2016/17, 109 inches in 2015/16, and and 170 in 2014/15. The 11-year average is 199 inches. There is 99% snowmaking coverage at Whiteface Mountain provided by 335 snow guns (200 of them low-energy and high-efficiency). The resort is in its third year of using 100% renewable energy. A 2.6 megawatt solar plant is being installed and the resort is expanding its use of infrared heating and energy-efficient LED lighting. Whiteface Mountain has 370 skiable acres; 3,430-foot vertical drop (the largest in the East); 20% beginner; 42% intermediate; 38% expert/advanced. Whiteface Mountain’s 87 trails run for 22 miles. In addition to the trails, true experts have the opportunity to explore 35 acres of The Slides, a double-black-diamond natural terrain, at an elevation above the height of three Empire State Buildings. There are also 53 acres of glade skiing. Advanced: Whiteface Mountain has some of the toughest skiing in the East including The Slides, “inbound off-piste double-black diamond wilderness terrain” meant only for the most talented skiers. (The Slides are often closed due to safety.) Advanced trails on the peak of Whiteface include Upper Skyward, Lower Skyward, Slide Out, Cloudspin Cut, Cloudspin, Niagara, and Blazer’s Buff. Those on Little Whiteface include Essex, Upper Northway, Approach, Upper Empire, Upper Mackenzie, and Upper Wilderness. Wolf Run and Wolf are closer to the Base Lodge. Intermediate: Accessible by the Gondola, Summit Lift, and the Lookout Mountain Triple are Whiteface Mountain’s intermediate trails, including Crossover Loop, Summit Express, Low Road, Parkway Exit, 1,900 Road, Calamity Lane, Ladies’ Ridge, Empire Cut, Draper’s Drop, River Run, Valvehouse Road, Glen, Excelsior, Lower Gap, Victoria, Weber’s Way, Riva Ridge, John’s Bypass, Tom Cat, and The Wilmington Trail (the longest intermediate run in the Northeast at 2.1 miles). Beginner: The green circle trails at Whiteface Mountain are accessible from the Bunny Hutch Triple, Mixing Bowl Lift, Bear Lift, and Face Lift. Notable beginner trails are Mixing Bowl (the bunny hill), Easy Street (the easiest off of the Face lift), Silver Shoot (short with gentle curves), Silver (a long cruiser trail), Gold and Bear (both wide and straight), Bronze (a little more challenging than Gold) and Fox (very wide). Others include Round-A-Bout, Medalist, Deer, Home Run, Upper Boreen, Easy Way, Bronze, Boreen Loop, Main Street, Medalist Cut, Runner Up, and Boreen. Lift tickets purchased online in advance vary greatly in price. Visit the ticketing site and select your number of days and the specific dates you are looking for. Base Camp Market: On the second floor of the Main Base Lodge, find soups, chilis, sandwiches, pizza, burgers, a noodle bar, and more. There are also salads, sandwiches, and snacks for those on the go. Mid-Station Lodge: For grilled fare like hot dogs, hamburgers, and breakfast sandwiches, visit the Mid-Station Lodge halfway down the mountain. Watch the action with a beer or hot cocoa in hand on the outside deck. Josie’s Cabin: On the Nordic trails, Josie’s Cabin provides delicious food and hot drinks. Roast your own marshmallows for s’mores by one of the fires next door. There are two Rossignol Experience Centers on the ground levels of the Main Base Lodge and Bear Den Lodge with more than 1,200 pairs of skis and 200 snowboards. Demo gear is available for rental. Get your own gear tuned and repaired by certified technicians. Brookside Apparel shops are located on the second floor of the Main Base Lodge and in the Bear Den Lodge. Nearby is Lake Placid Ski & Board, voted the best ski and snowboard shop in upstate New York. Cunningham’s Ski Barn, since 1934, has gear and rentals in two locations on Lake Placid’s Main Street and North Creek. Kids ages 4-6 can choose from “Play-n-Ski” (a program combining ski lessons and indoor play time), “Riglet Park” (snowboarding), or “Future Medalist” (a season-long program). Seven- to twelve-year-olds can take “Junior Adventure” lessons and seven- to fourteen-year-olds can participate in the “Cloudsplitter Club”, a season-long program for either skiing or snowboarding. Non-skiing children can be dropped off from ages 1 to age 6 off at “Cub Camp” for supervised arts and crafts, games, and sing-a-longs. A three-day program “Parallel From the Start” is recommended for beginners 13 and older. The beginners-only Bear Den Mountain Area is a no-pressure area for beginners to work on their skills. Private lessons are available for all ages and abilities. A special “Snowboomer Club” senior program (50+) combines a lesson with a social hour of cookies and snacks. Perks and discounts are included. For serious skiers with dreams of gold medals, check out the renowned athlete programs within the New York Ski Educational Foundation. Adaptive programs are available for adults and children with disabilities for both skiing and snowboarding. Bobsledding: Slide around the curves, speeding through the official Olympic track for a half mile in less than 40 seconds. The unique experience includes a professional driver and brakeman, commemorative lapel pin, a team photo, a t-shirt, and 20% off a second ride within the same season. Similar experiences are available on the luge and the skeleton. Reservations are highly recommended. Cloudsplitter Gondola Ride: Soar above the snowy and scenic Adirondacks from the Main Base Lodge to the peak of Little Whiteface in an eight-person, high-speed gondola. The 15-minute ride takes you to a picnic area and an observation deck. The experience is weather-permitting. Ice Skating: Skate at the indoor rink where “Miracle on Ice” happened or speed-skate (next to a warm fire where you can get hot cocoa) around the Olympic Oval. Rentals are available. Nordic Skiing: 50 km of perfectly groomed trails await you at Mt. Van Hoevenberg. National and international events are often hosted. Rentals and lessons are available. Take part in a biathlon and practice your riflery. Search area accommodations for the perfect ski getaway, whether you crave luxury or require something easy on the wallet. The Adirondacks have B&Bs, cabins, hotels, resorts, condos, rentals, hostels, environmentally-friendly options, and more. Mirror Lake Inn Resort & Spa is a four-diamond property with its own private ice-skating rink, three restaurants, a spa, amazing views, and European charm. Lake Placid Lodge is on our list of best ski hotels in New York for its views.